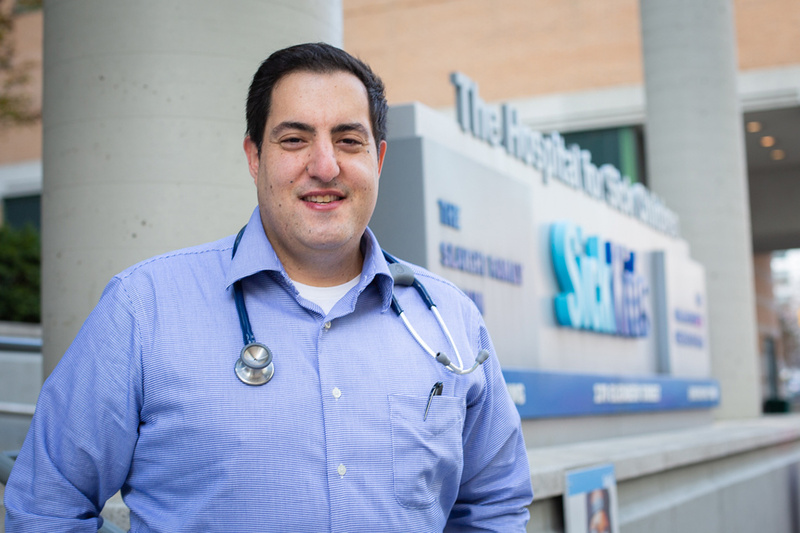 The road to medical school wasn’t a straight path for Adam Shehata. But when he crossed the threshold of The Hospital for Sick Children for his first day of a pediatrics rotation in the University of Toronto’s MD program in late November, he knew he’d reached an important destination. Born in 1982 when his mother was just 24 weeks pregnant, Shehata weighed 660 grams. He was quickly transferred to SickKids. The first four months of Shehata’s life were spent at SickKids until he was ultimately able to go home – by ambulance and with supplemental oxygen. Through childhood, Shehata lived with respiratory issues including severe asthma. He recalls having to stay home from school often, connected to machines that delivered medication. He also underwent a number of ear, nose and throat surgeries – again, at SickKids. Thankfully, says Shehata, most of his health problems have cleared up, paving the way for him to pursue a variety of passions. At 15, Shehata was on a plane home from Cairo, Egypt, where his parents had grown up. His father – a pilot – knew the aircraft’s captain and offered to bring the teenager to see the cockpit. He soon became involved in Air Cadets and began to fly glider planes when he was 16. Then he enrolled in Seneca College’s aviation program. After graduation, Shehata spent the next few years working as a pilot, earning additional credentials and, eventually, his airline pilot’s license — needed to be captain of a large commercial airliner. He also became a trainer, helping teach other commercial pilots to become flight instructors. But the financial collapse of 2008 hit, taking its own toll on an airline industry still feeling the effects of 9/11. Shehata toyed with the possibility of returning to school to prepare for a second career. Shehata married and, in lieu of wedding favours, the couple made donations in their guests’ names to two charitable organizations. One of them was SickKids Foundation. When Shehata’s wife became pregnant, the couple learned early in the pregnancy their baby had a severe heart defect. They met with several medical professionals and were ultimately referred to SickKids, where they spoke with a pediatric cardiologist. Meanwhile, another interest was taking off for Shehata – law. He applied to medical school and law school at the same time. He was offered a spot at York University’s Osgoode Hall Law School. He deferred his acceptance for a year and used the time to pursue additional studies in science and strengthen his next medical school application. Once in law school, Shehata nurtured his continued interest in medicine through health law courses. Ultimately, Shehata was offered an interview at U of T’s MD program and was placed on the wait list around the same time he completed his articles to become a fully licensed lawyer. Not knowing if he would finally secure a seat in the class, Shehata looked for work as a lawyer. In the end, he received two offers — one for a job, the other for a spot in U of T's MD program. Today I start my paediatrics rotation for @uoftmedicine at @SickKidsNews. 36 years ago, this hospital and these amazing people saved my life. The response, he says, has been both unexpected and overwhelmingly positive. Shehata says many of the people who have reached out to him are parents and caregivers of premature babies or health-care providers. In being open about his experience, Shehata hopes to inspire the parents and caregivers of children with medical needs. He has another message, too – about the importance of preparation. Shehata points to one of his heroes, Capt. Chesley “Sully” Sullenberger, who landed a stricken US Airways Flight 1549 onto New York City’s Hudson River back in 2009. “If you look closely at what he and his crew did, there was a ton of preparation, skill, training and professionalism that went into what they were able to do that day,” Shehata says. “Providing care is similar. We spend years training, whether we’re preparing to become a doctor, nurse or an allied health professional. My mother tells me one of the things she remembers most vividly from my time in hospital was the exceptional care I got from the doctors, as well as the nurses. And not just the skillful medical care, but the fact that the nurses would take me out and they would cuddle me.